The folks at the City must be quite angry with Daniel Boffo to decide to post this letter on their website. Posted in Uncategorized on July 2, 2018 by pennystreet546. 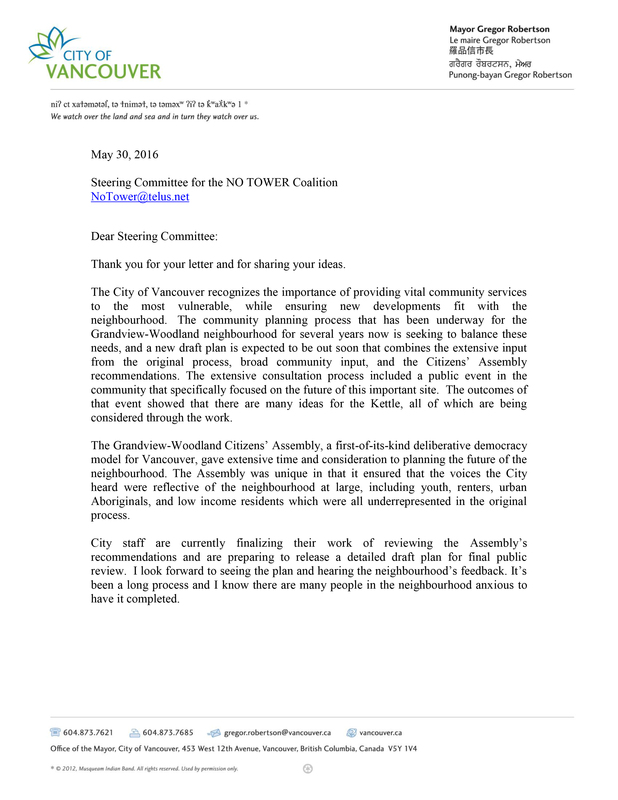 The NO TOWER Coalition in Grandview-Woodland reacted with considerable relief this week, on learning that a proposed 12-storey BOFFO/KETTLE tower project on a key corner of our community has been shelved. Contrary to assertions in the BOFFO/KETTLE announcement, this project was NOT broadly welcomed by the community. The NO TOWER Coalition gathered 4,433 signatures on petitions opposing the 12-storey project and for many months in 2016, the neighbourhood was blanketed with lawn signs opposing the tower. 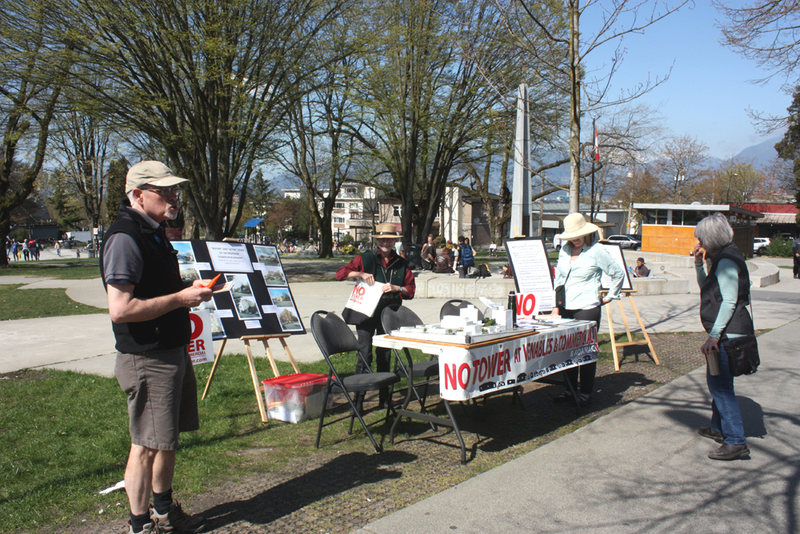 The coalition also gathered hundreds of postcards written by community members, articulating deep concerns about the proposal, which were presented to Vancouver City Council. Key concerns were the escalating impact that a top-of-market 200-unit condo building would have on neighbouring property values and the resulting loss of many nearby affordable rental buildings providing essential housing in the neighbourhood. The Coalition has always supported the aspirations of the Kettle Friendship Society, to provide much-needed services. But on balance, the tower proposal’s many negative impacts on Grandview-Woodland did not make it a welcome approach. Instead the NO TOWER Coalition has proposed that the City of Vancouver portion of the proposed site (a land parcel at the north end of the property) be provided to the Kettle at a nominal cost, for construction of a six-storey building for Kettle services and non-market and low–end-of-market housing (see Our Alternative). At the same time, the Coalition has proposed that the existing Commercial Drive street frontage adjacent to the proposed development (between the development and Uprising Bakery) be turned into a pedestrian “piazza” to enhance the neighbourhood. The Coalition stands behind these two very practical and achievable ideas. It’s time the City of Vancouver looked at directly providing city lands for community and housing uses, rather than relying upon massive and intrusive developer-led projects such as this destructive BOFFO/KETTLE tower idea, to get much needed social services. Posted in Statements on June 21, 2018 by pennystreet546. 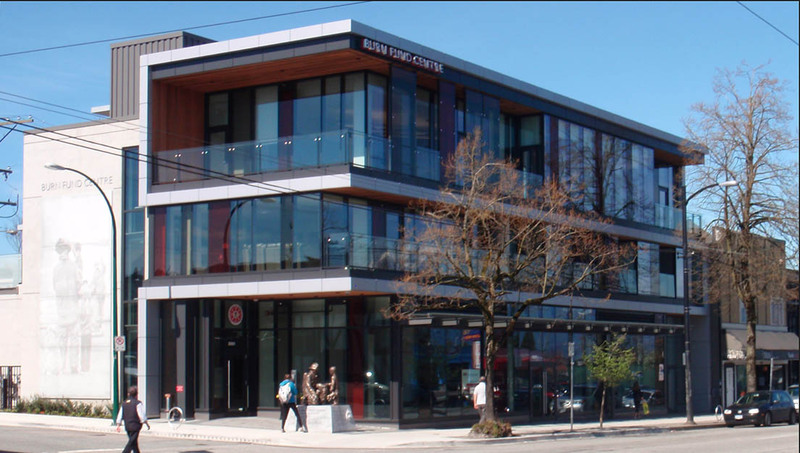 Recent news of a proposed six-storey market rental building slated for the corner of Adanac Street and Commercial Drive in Grandview–Woodland bears out the creeping density predictions made by the NO TOWER Coalition. The proposed project, if approved by the City of Vancouver, would sit directly across the street from the controversial Boffo/Kettle 12-storey tower proposal at the corner of Venables and Commercial Drive. This latest market rental proposal is just north of the Uprising Bakery building and immediately beside the Entre Nous Femmes Housing Co-op to the west. The Boffo/Kettle proposal is highly controversial and much opposed by the residents of the community, 4,433 of whom signed a petition against the highrise. Its progress currently appears to be in limbo, more than 18 months after the city gave its approval in principle, during the adoption of the Grandview-Woodland Community Plan. 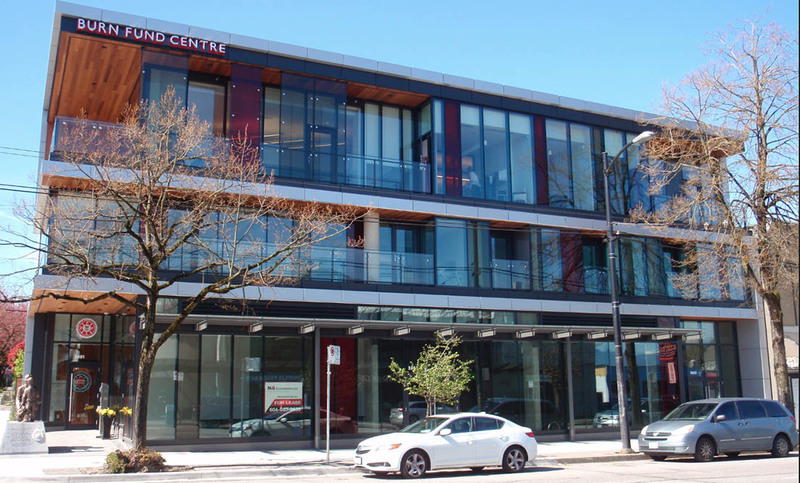 Developers for the new rental complex, directly across the street, have made application for a rezoning by the city and will hold a community open house Thursday April 19th at the Vancouver Aboriginal Centre, 1607 East Hastings Street. If the development goes ahead it will bring even greater density to a key corner of Grandview-Woodland already under great pressure due to the Boffo/Kettle tower proposal. The NO TOWER Coalition predicted that approval in principle of the Boffo/Kettle project would put great pressure on the immediately surrounding area, home to many older apartment buildings, housing co-ops, and other affordable rental properties. In fact the current piece of land proposed for this rental building was subject to renoviction actions by the owner who also attempted to rent out a windowless shed on the property on Craigslist as a “one bedroom with kitchen apartment”. News of the “shed for rent” controversy caused the city to shut down the rental notice, which was then pulled from Craigslist. The zoning of the land in question for this new rental building currently stands at 4 storeys according to the community plan, but this building would be six storeys, extending right to the curb, with retail at ground level and 38 secured market-but-by-no-means-affordable rental units. Ironically, one of the benefits of this proposal, according to Cornerstone Architecture, would be a closed pedestrian zone on Commercial Drive from Venables to Adanac. This “piazza” idea was in fact one of NO TOWER’s ideas, proposed in support of a much smaller and lower density alternative for the Kettle Friendship Society on the site. 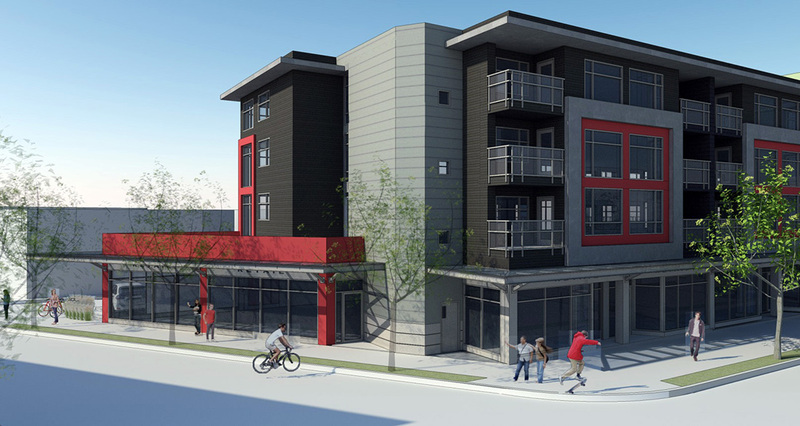 This rental apartment proposal comes in the midst of a veritable land rush in Grandview-Woodland with dozens of land-assembly deals being proposed. NO TOWER fears that within a few years Grandview-Woodland be virtually unrecognizable and will lose many of its affordable rental units to be replaced by luxury condos, expensive townhouses, and market rent buildings, at much greater cost. For more information go to http://rezoning.vancouver.ca/applications/825commercial/index.htm. Posted in Uncategorized on April 12, 2018 by pennystreet546. 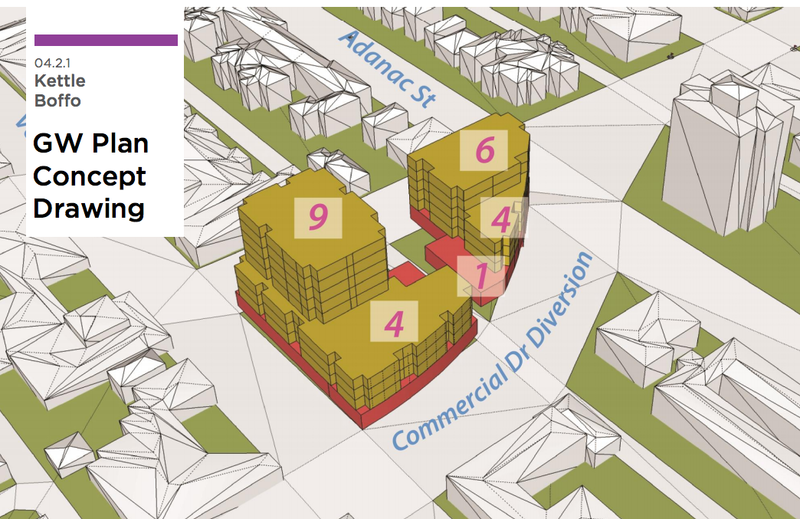 Back a whole long one month ago, when the planners released the new Grandview Woodland Community Plan, the No Tower Coalition noted that the height at Commercial and Venables had been slightly reduced to 9 storeys. At the time, we were somewhat suspicious of the wording, which indicated that additional height and density would be considered if additional amenities could be secured. We feared a bait and switch tactic: appearing to appease us in the Plan, but going back to the original height (12 storeys) and density (6.6 or so) once the community had quieted down. Well, unfortunately, we were right. Today, Council did go back to the original height and density. However, this was not with community consent. Indeed, Council went back to the original height and density even though the community clearly opposed it given over 4400 petition signatures, over 300 postcards, and over 110 letters sent in to Council since Saturday, July 23rd alone. For those who did not attend the meeting or watch the broadcast, Clr Andrea Reimer came forward with a number of amendments to the Plan this morning. (Interesting how City Councilors can do this, but citizen input doesn’t change the plan in any way!) One of them was to set the height at Commercial and Venables back to 12 storeys. Now, whether this means that the Plan was released in bad faith, with no real intention of ever implementing the 9 storey limit on Venables and four along the Drive, or whether this means that Council has total disregard for both the expertise of planners and the desires of the public, is hard to say. However, all but two councilors voted for this amendment. The two who did not were Adriane Carr and George Affleck. For that, we commend them. 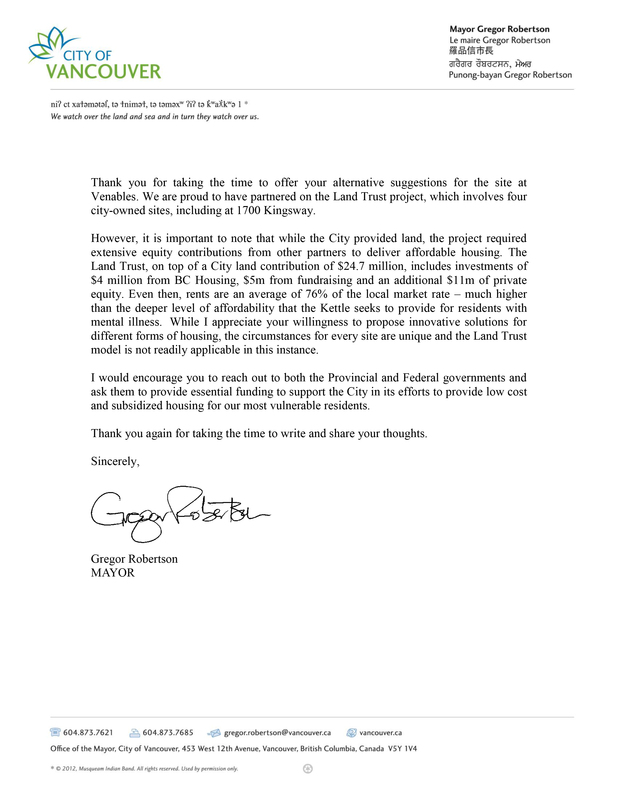 While the impossibility of providing what the Kettle needs with government funding or (gasp) only 9 storeys of condos was reiterated many times over the three days of discussion on the Plan, we have never seen a proforma or other evidence of the funding necessities from either Boffo or the Kettle. No councilor asked exactly what was meant when Nancy Keough insisted that only with 12 storeys could the project “break even.” We doubt very much that it meant that Boffo will be working for costs. We are disappointed that the public was ignored, that the No Tower alternative for the Kettle expansion including 21 additional units of rental housing was ignored, and that the Plan itself was ignored. But, in addition to that we are outraged that our city councilors, with a few exceptions, are unwilling to consider that funding basic mental health and poverty services through condos sets a terrible precedent for our senior levels of government to keep disinvesting from our most basic public systems. We are further outraged that some councilors have gone so far as to call any one of us who criticizes projects such as Boffo/Kettle so callous as to want the deaths of the most vulnerable in our society. This is disingenuous political hyperbole that undermines dissent and ultimately promotes developer greed over social good. We do not yet know how we will proceed in any future rezoning hearings, but we do know that this loss has been an important one for us, for our neighbourhood, and for our public welfare systems, which desperately need reinvestment. While many councilors stated that we cannot wait for government funding and therefore have to proceed with the Boffo/Kettle project, we believe that we cannot wait for this Vancouver condo boom to crash to begin reinvesting public money in public services. Only by sharing our country’s wealth among ourselves, rather than offering it on a platter to developers, will we achieve any real change for those who use the Kettle along with the increasing number of disenfranchised and destitute people in our city. BC Housing Press Release and CMHC Press Release about available funding for affordable housing. Posted in Uncategorized on July 19, 2016 by None. The No Tower Coalition is putting on a community workshop on how to present to City Council and how to write to Councillors. Please join us at 7:00 p.m. on Tuesday, July 19th, in the Board Room at Britannia Centre (in the Info Centre building). Bring your ideas and questions. Participation isn’t limited to the issues concerning Venables & Commercial. You can talk about anything you have to say about the draft Grandview Community Plan and would like to share with Council. Posted in Uncategorized on July 11, 2016 by pennystreet546. The City presented its own concept for Commercial and Venables to the Citizens’ Assembly. It contains less density overall, a tower of 9 storeys on Venables and maximum 6 storeys on the north half of the site. This sounds like an improvement, but actually doesn’t answer the concerns of the No Tower Coalition. 9 storeys is still too high. We want human scale. There is no substantial public or green space added to the plan. Our neighbourhood is park deficient. This still adds expensive, high-end condos to a low-income and renter-predominant area of the neighbourhood. We want protection against rising land value and rent rates. City planners are already warning their scenario has a “funding gap” that will make it impossible to meet the Kettle’s needs without more density. We fear a bait-and-switch tactic, taking us back to the height and density we originally rejected. The City’s plan will still require a spot rezoning. We oppose all spot rezonings as they diminish community control and government accountability. Let Council and planners know what you want at Commercial and Venables! Complete the City’s questionnaire about the Grandview-Woodland DRAFT Community Plan. Check out the next two posts, below, to get ideas. 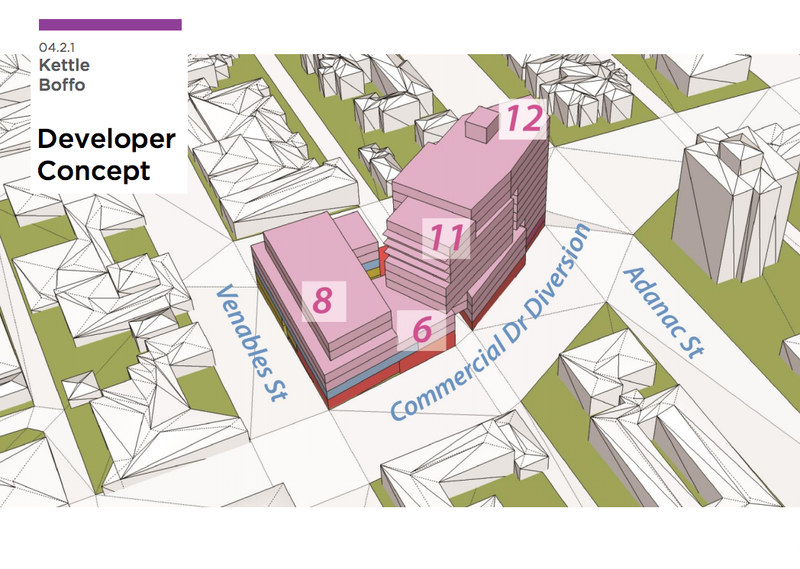 In the draft Community Plan, the City has crafted a new proposal for Commercial and Venables. This is in contrast to the “Developer Concept” that’s been promoted by KettleBoffo for some months. Below are two renderings that were shown to the Citizens Assembly and media this week. The pink one shows the KettleBoffo proposal; the yellow one shows the City’s new alternative. While the height and mass are somewhat reduced in the City’s proposal, the Community Plan says it could be possible to add considerable height and density if the developer says it can’t get enough profit to provide the Kettle what it needs. This could, we fear, put us right back where we began, with an unacceptable multi-tower complex. See our next post for a description of the kind of development we envision for the site, that would satisfy both the community’s and the Kettle’s needs on a human scale. Posted in Uncategorized on June 30, 2016 by pennystreet546. We need to debate whether our rush to up-zone and redevelop the whole city is driving up the cost of real estate. The term NIMBY is increasingly being used against neighbourhood-based activists opposing development. Calling people “NIMBYs” has proven an effective way to shut down discussion and stifle debate. While global capital and speculation in our real estate market is a factor driving up prices, enabling that is our rush to up-zone and redevelop every inch of the city with new condo towers. A flashpoint for NIMBY name-calling is the No Tower campaign in Grandview-Woodland, where many see the Boffo/Kettle proposal as bringing needed density to the neighbourhood. But, for the proponents of the No Tower position, the supposed NIMBYs here, the ripple effect of rising land values and rents if we allow 200 market-priced condos into a relatively low-income, high-rental area of the neighbourhood is not worth 30 additional social housing units. We might add 30 social housing units, but at what cost to the other low-income and vulnerable renters in the immediate vicinity of the tower? As many activists in the Downtown Eastside, Marpole, and the West End will tell you, building new, both condo and rental towers, in this market, has been a recipe for skyrocketing land value, rent, and displacement of low and modest-income residents. Vancouver City Council already approves more new development than is needed for population growth. In this market, where speculation reigns, large-scale up-zoning of neighbourhoods raises rather than lowers housing prices. Density is driving up the cost of land, which is driving up the cost of housing. The best affordability will come from controlling speculation, building within current zoning for the most part (current zoning is already enough to accommodate the influx of population according to the City’s own report), and respecting the rights of citizens to have a say in their own neighbourhoods. Resorting to ad hominems rather than promoting healthy debate only fuels the capacity of development promoters to set the terms of the debate, something that will ultimately undermine the very city we all care so much about. Posted in Uncategorized on June 18, 2016 by pennystreet546. Vancouver 6th June 2016. In anticipation of a pending decision on the future of Venables and Commercial in Grandview-Woodland, the NO TOWER Coalition today delivered a comprehensive package of material to City Hall. “We are extremely disappointed that Mayor Robertson has refused to meet us, despite repeated requests,” says Barbara Cameron. “It’s his public duty to listen carefully to constituents.” The citizens of Grandview-Woodland are keeping a close watch on their elected representatives and city staff, as they await the next version of the community plan on June 25. With new federal and provincial dollars now available, a viable alternative is possible for the Kettle on city-owned property to the rear of the site, notes the Coalition. This option would require the donation of city land. There are several recent city precedents for this approach. Building the BOFFO/Kettle proposal would have a devastating effect on the neighbourhood, with more possible towers, further upward pressure on land prices, and loss of nearby affordable housing. The Coalition supports the overall goals of the non-profit sector to provide for the neediest in society, but not at the expense of an entire community’s wellbeing. Posted in Media, Petitions on June 6, 2016 by pennystreet546. The No Tower Coalition community outreach table was out in the sunshine at Grandview Park again today. 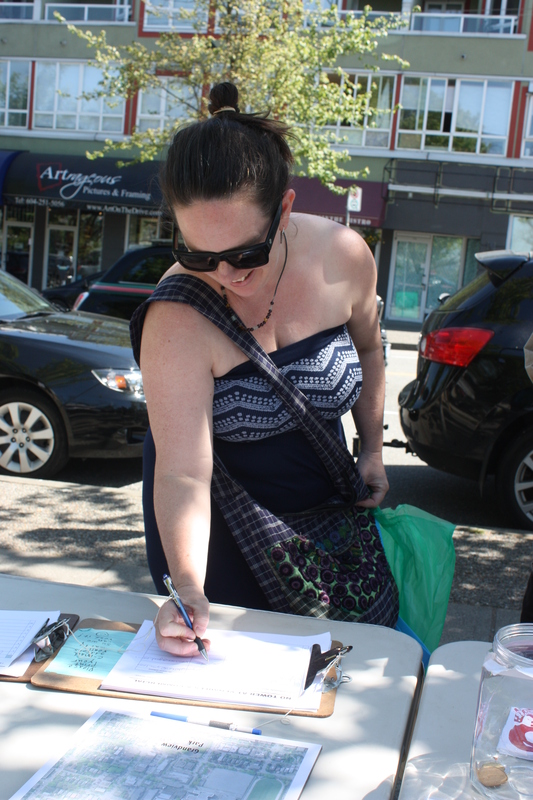 Volunteers shared old and new information about the proposed tower at Commercial & Venables, and collected a lot more signatures on the petition. Support for a non-tower alternative continues to build. Posted in Community on April 2, 2016 by pennystreet546.